This is a 2 step process. First, deep fry in 350 degree oil for 10-15 seconds. Then transfer onto cooking tray and cook in a 350 degree convection oven for 4-6 minutes or until done. For conventional ovens, preheat oven to 400 degrees. From frozen bake skewered items for 12 - 22 minutes. Cooking times vary based on deep fryer and oven. Do not microwave. A tropical delight. 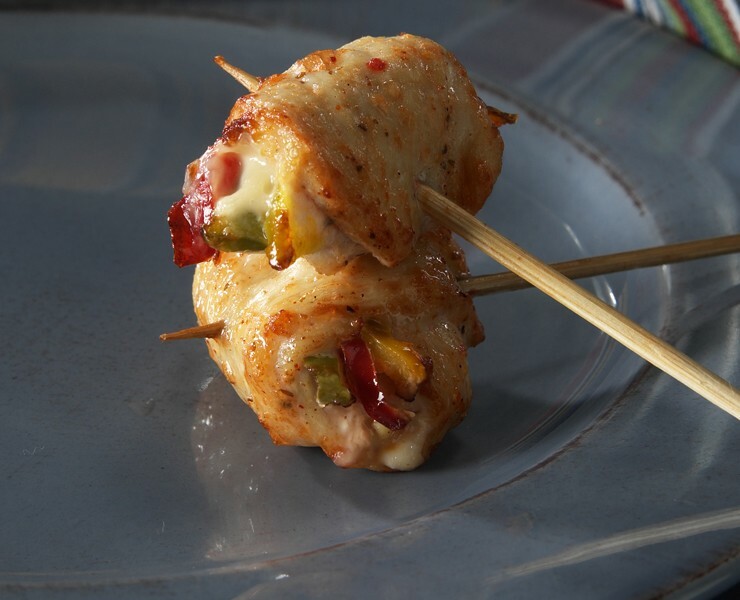 Tender chicken breast with crispy red and green peppers and a pineapple chunk on a 6" skewer. Grilled Portobello mushrooms with fresh Roma tomatoes, roasted red pepper, Monterey Jack and goat cheese in a light flaky pastry.